Earlier this month Japanese teenager Miu Hirano shocked the current World no.1 and Olympic and World Champion, Ding Ning in a nail biting five games victory at the Seamaster 2017 ITTF-Asian Championships in Wuxi, China. 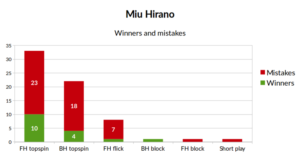 Let's take a deep look into Miu Hirano's winning strategy, explained in numbers which justifies her victory. We all saw this 17-year old Japanese shatter the dreams of Ding Ning to win the prestigious Asian Championship title. We all saw an increased speed in her body, the aggressiveness in her forehand shots, the greater depth in her forehand flips and the variations in her magical serves that made her thrive better than Ding Ning that day. But what does this mean in numbers? What exactly was Miu Hirano’s strategy to conquer over Ding Ning so that these improved strokes could be used in a diligent and strategic manner? According to the post Ding Ning – Miu Hirano:Beating China, Beating the odds on a table tennis blog www.zoomtt.com, there are many intriguing explanations. To start with, Ding Ning’s forehand topspin did not quite work the way it generally does. She attempted it a total of 48 times, having missed 15 of them and attempting only one winner. Yes, not quite the Ding Ning way. She was surely not in her best form. On the other hand, Miu Hirano took risks in her forehand attacks. 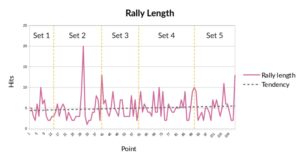 She attempted her forehand attacks for a total of 98 times, with 30 mistakes and 11 winners. This means, Ding Ning averaged a 31.25 per cent mistakes while Miu Hirano’s was 30. 61 per cent. Round it off, both made 31 per cent mistakes. However, Miu Hirano took more risks, she attempted 11 winners versus only one from Ding Ning, giving her an upper hand. 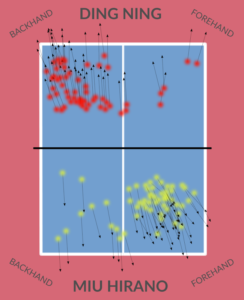 The article also mentions an interesting fact that most of the strokes (forehand and backhand topspin, block, push and flick) attempted by Ding Ning were fairly balanced in terms of frequency, the only notable factor is that 70 per cent of them were from the backhand side. However, for Hirano, 80 per cent of her strokes were forehand and backhand topspins, out of which 60 per cent were from the forehand side. This means that Hirano was not only aggressive, but she was also more aggressive from the forehand side than the backhand. Furthermore, the article mentions that Ding Ning counteracted Miu Hirano’s attacks with her backhand blocks, making it the most fruitless stroke. Clearly, Ding Ning was mistaken in her strategy here. She should have attempted more of backhand counter topspins instead of blocks. Why she did not do it? There could be many reasons- either Hirano’s topspins were too powerful for Ding Ning (making it hard to control the spin and speed of the ball), or they were too quick (giving her less time to react) or she just had some issues mentally, in the head. Finally, the serve! Kong Linghui emphasized that Miu Hirano’s serve gave them the most jitters and that the Chinese team will study her serve to understand it better. Well, against Ding Ning, it was Hirano’s placement of the serves which made all the difference. Majority of her erves were placed on Ding Ning’s backhand, forcing her to attack the second ball, which gave Hirano a good ball to counter attack justifying her being aggressive. In short, Hirano’s strategy was to keep the ball to Ding Ning’s backhand and to keep her forehand attacks and counter attacks going on despite a higher risk. Additionally, she took advantage of Ding Ning’s backhand receive and exploited that area well by strong counter attacks. Moreover, Ding Ning was just weak with her forehand that day and was more passive from both backhand and forehand side as compared to Hirano.